This is very interesting stuff, as it hints at all kinds of machinations that have gone on behind the doors of the Tory party to ramp up the controversy about immigration artificially as a way of stoking popular resentment against the EU. On Sunday, Mike also put up an article forecasting that May’s speech on Tuesday about Brexit would be a disaster, and that it would show her absolute failure to control immigration. Mike was informed by his commenters, Wanda Lozinska and Pat Whitaker that six years ago the EU passed legislation that would limit the time EU citizens could freely circulate in a foreign country to three months. After this time, they would have to show that they either had a job, or could support themselves through their savings or insurance without relying on the host nation’s welfare services. But Britain was one of the few states that did not adopt this legislation. This was when May was head of the Home Office, which is in charge of immigration. So Theresa May has always been able to curb immigration. She simply chose not to. One has to wonder why not. Is there a secret aspect to this, that we haven’t been told? It looks that way. Of course, there are distinct advantages to big business to keeping up a high immigration rate, regardless of what the Tories may say about the need to curb immigration, national sovereignty and the rest of the guff. A plentiful supply of labour means that wages can be kept low, and unions weak. If your staff start complaining about poor wages and conditions, you can simply sack them and replace them with people even more desperate for work from eastern Europe. You can also keep the working class divided by stoking up nationalistic resentments against foreign nationals. Counterpunch today has put up a very interesting article about how the Jim Crow laws in the southern American states during Segregation served to keep the working class weak and divided by pitting Black and White blue collar Americans at each other’s throats. See Kevin Carson’s article ‘Right to Work and the Apartheid State’, at http://www.counterpunch.org/2017/01/19/right-to-work-and-the-apartheid-state/. And quite apart from the economic aspects, the Tory party clearly also used immigration from eastern Europe and the EU to pose as the defender of the traditional British population from the threat of all those foreigners, just as its always banged the jingoistic drum against EU legislation when it served their purpose. It seems to me absolutely certain that May and the Tories have kept immigration high despite, not because of the EU as part of their policy of grinding down the working people of all countries for the enrichment of big business. Don’t be taken it. The Tories are not the friends of British working people. They want to stoke up insecurity and xenophobia between people of different races and nationalities, all the better to exploit them. Reject them and their bigotry. Marx was right: workingmen [and women] of all countries, unite! And defend the NHS. May and Hunt must resign. Now! ‘The creation of Britain’s welfare state in 1948 was an event of major international importance and is widely regarded as the crowning achievement of Attlee’s Labour government. On its fiftieth anniversary, for example, New Labour proclaimed ‘at its birth, the vision was broad … We need to capture that original Vision. The blurb states that the book is intended ‘to inform and stimulate debate by providing a concise introduction to the evolution of both the structure of the welfare state and the attitudes towards it.’ It has an introduction, and then chapters on the political debate, social security, health care, education, housing and personal social services. There is also a chronology of events giving the year, the government of the time, and the events in the above departments of the welfare state. This begins by noting New Labour’s ambivalence towards the welfare state, shown in the muted nature of the celebrations of its fiftieth anniversary in 1998. It then has the following sections: Defining the Welfare State; the Core Policies; the Exception of Employment Policy; and the Evolution of the Welfare State. This chapter is divided up into sections, each containing documents relating to that subject or area. The first is on Democratic Socialism, and has pieces on Marshall and the Evolution of Social Equality; Titmuss and the Virtues of Collective Action; The ideological Divide between Labour and the Conservatives, written by Anthony Crosland. The next section, Reluctant Collectivism, has extracts on One Nationism’ the Market and Community Case for State Welfare. Following this is the section on the New Right, with an extract from Hayek’s Roads to serfdom; the Institute of Economic Affairs and Choice in Welfare; Sir Keith Joseph and the Origins of ‘Thatcherism’; Charles Murray on the Emerging Underclass. The next section is on New Labour, and contains extracts from the 1994 Commission on Social Justice; There is a section on Incorporating Feminist Perspectives; after this is the sections on Frank Field and ‘Stakeholder’ Welfare, setting out his ‘Key Political Assumptions’; and Anthony Giddens and the Third Way. The Expansion of Social Security, with extracts on the Beveridge Vision, with its Three Guiding Principles of Recommendations, the Six Principles of Social Insurance, Flat Rate of Subsistence Benefit, Flat Rate Contributions, Unification of Administrative Responsibility, Adequacy of Benefit, Comprehensiveness and Classification. The next section is on Bevan’s abolition of the Victorian Poor Law, the Times’ summary of the Atlee’s welfare state, the introduction of earnings-related benefits, and Equality and Pensions. The section after this is on ‘Modernising’ Social Security, with sections on Thatcherite Principles, Breaking the Benefit-Earnings Link; the 1985 Social Security Review, the 1986 Reforms, Re-thinking Labour Policy, the 1998 New Deal and the Working Families Tax Credit. The next section is on the Controversy between Universalism and Selectivity, with sections on Choice in Welfare, Defending Universalism, Targeting and the 1976 introduction of child benefit. After this is the section on the Poor, with extracts on the Reality of Poverty in the 1950s, the ‘Rediscovery’ of Poverty in the 1960s, Low-Income Families in the 1970s, and Living on Social Security. The last section of this chapter is on Poverty and Social Exclusion, drawing on the 1999 census. The chapter on Health care also had an introduction to the issues involved, and then sections on the Vision, with an extract on Wartime Plans; the Allocation of Scarce Resource, with extracts on Bevan on Finance, The Guillebaud ‘Economy’ Report, 1956, and Enoch Powell and the Fundamental Dilemma; Restructuring the NHS, with extracts on the 1974 reorganisation, the Managerial Revolution, the 1988 Thatcher Review, the Introduction of Internal Markets, New Labour and the NHS; Controversies, with sections on Bevan’s Resignation, Pay Beds, and Privatisation and the 1988 Review; Health Outcomes, with extracts from the 1980 Black Report, and Health Inequalities. This chapter has sections on The Vision, comprising extracts on the Wartime Ideals, Scientific Manpower, Conservative Ambitions, Higher Education, Nursery Education, Special Needs and Multicultural Education; Controversy: Comprehensive Education, with extracts The Case for the Defence, from Robin Pedley’s argument for it, the Conservatives attempt to reinstate choice in 1970, Labour’s insistence on reinforcing compulsion in 1974, and the Thatcherite Response; Controversy: the National Curriculum. This begins with a discussion of William Tyndale School, which became a national scandal. The teachers there were extreme advocates of ‘child-centred learning’, who didn’t really want to teach. Private Eye’s Ian Hislop included the scandal about the school in his history of education broadcast one Christmas a few years ago. One pupil at the school said violence from other pupils was so bad you daren’t go there without being ‘tooled up’. One teacher taking a reading group simply wrote on the blackboard, ‘I hate reading groups and sent the children out to play’. When confronted with the fact that most of the pupils at the school couldn’t read, the teacher’s replied that neither could people in the Middle Ages, ‘yet they built cathedrals’. The result was an outcry that resulted in the teachers involved rightly losing their jobs, and a campaign to introduce a national curriculum. Other extracts in this section include James Callaghan’s speech launching a great debate on the National Curriculum in October 1976, Shirley Williams as a representative of Old Labour on a ‘Core’ Curriculum, Margaret Thatcher’s Response and Attacks on the National Curriculum. the last section is on the consensus on education in the 1990s, composed of two extracts, the first on the Thatcherite Revolution, and the second on Labour’s continuation of the same policies. The chapter on Housing has sections on the campaign to end the housing shortage from 1945 to 1955, consisting of further sections on wartime plans, Bevan’s position, the Conservative Vision and Macmillan’s Achievement; the Restoration of the Market, with sections on the 1957 Rent Act, the 1959 Labour Manifesto attack on the Conservative’s record, the Milner Holland Report into the operation of 1957 Act, and scandals such as that of the brutal slumlord, Peter Rachman, the 1965 Fair Rent Act, the shift from building new houses to the renovation of older properties, the 1972 Housing Finance Act,and Anthony Crosland’s attack on the 1972 Act. The next section, Eroding Public Provision, 1979-1998, has sections on the sale of council houses, the fiasco of the 1984 simplified housing benefit, which bore out Crosland’s previous criticisms of the 1972 Housing Finance act, the 1988 Housing Act, New Labour’s adoption of the same principles, and the implementation of the divide between provider and purchaser. The next section is on Causes Celebres, with sections on the outrage over Peter Rachman’s brutal treatment of his tenants in the East End; the explosion in the Ronan Point block of flats, which ended the construction of tower blocks, the foundation of the homeless charity, Shelter; the controversy over Clay Cross, in which the local council refused to raise rents resulting in a bitter political campaign that resulted to the radicalisation of the welfare state and the Winter of Discontent; and the New Labour Social Exclusion Unit’s Report on homelessness. This chapter on The Personal Social Services contains sections on the Statutory Sector, with extracts from the 1965 Seebohm Report, the 1986 Audit Office Report on the failure of the policy of ‘Care in the Community’, and the Thatcherite Solution. This is interesting, because it was delayed due to its recommendation that local authorities should work to clear objectives with proper government funding. The best care was to be provided for those in need regardless of the whether the organisation providing it were state, voluntary or private. The Tories did not naturally like this, as it appeared to enlarge the role of the government, not reduce it. The next extract in this section was New Labour’s Solution. The section on the Volutary Sector begins with Lord Longford’s defence of voluntarism, extracts from the Seebohm and 1978 Wolfenden Reports and the Conservatives’ re-prioritisation of voluntary provision in 1981. The next section, Children in Need, has a extracts from Lady Allen’s letter, highlighting the terrible conditions endured by children in care homes; the death of Dennis O’Neill, a 13 year old boy, who died of maltreatment at the hands of his foster parents; the 1948 Children Act, the 1960 Ingleby Report; the death of a seven year old girl, Maria Colwell, while supposedly under the protection of social workers; the 1989 Children Act, New Labour and the Crisis of Child Care, the 1997 Utting Report on the systematic abuse of children in care homes, and testimony by the children themselves on the failure of legislation to protect them. 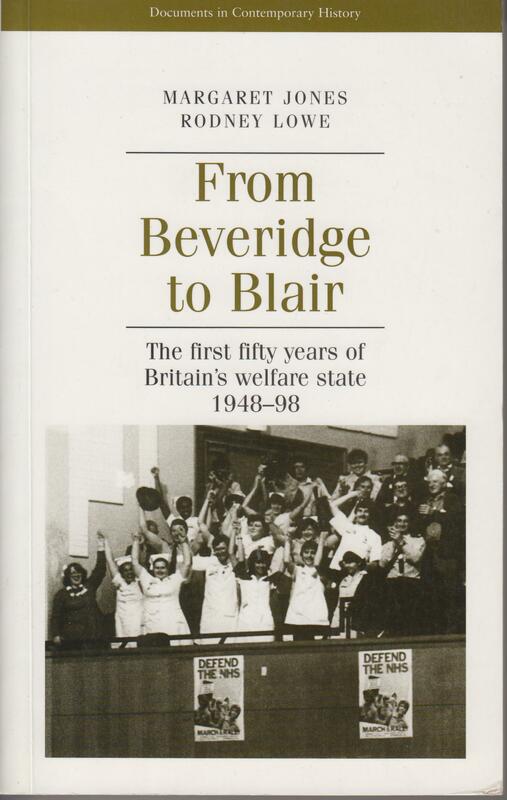 The book is a fascinating overview of the first fifty years of the welfare state, as recounted and described by the people and events that set it up and shaped it. It shows the transition from the state provision of welfare services established at the Welfare State’s inception after the War to increasing private and voluntary provision of services, as well as reports on the failure of these policies. Critical to the process of privatisation has been the ideas of Von Hayek, introduced into Britain by Americans such as Charles Marshall, and into the Conservative party by Sir Keith Joseph and his protégé, Margaret Thatcher.